lovely work! Thank you for sharing. Those matte and iris colours are teh lushness. I have been having fun with twin beads, using them to bezel rivolis and stones.... ast night I dreamed of another way to use them so perhaps I'll try that out today. I so wish I could watch you work... Luv the thought that goes into each piece and the exquisite detail! Such beautiful designs, Nancy! I can't wait to make my own "Runway" bracelet! Hope you'll have the tutorial for the pink/gold/green one, too! Thank you Callie! I can't WAIT to see yours!! Beautiful. I think you should turn the other into a pattern also. I love your twin designs... it almost makes me want to cut up the piece I tried to make with them when they first came out, and have another go! I got so angry with their lack of uniformity... but they were very close together! Gorgeous designs! I love your work. Thank you so much, Becs!!! You're very inspiring yourself, you know!!! I love what you make, and I am SO loving your new embroidery!! Those are lovely! I am also stumped on the long magatamas - I am hopeful that once I have them in hand something will spark! Oh, I'm hoping too, Cynthia!!!! :) Thank you!! Beautiful - I love both designs. The teal in the first bracelet is absolutely gorgeous. I also love your second design - such a pretty piece. 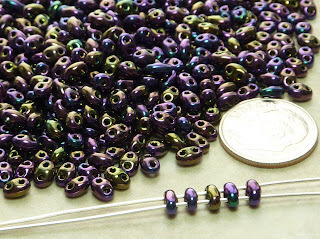 I've just ordered some twin beads so might have to invest in one of your patterns when they arrive! This probably sounds really dumb but can u tell me what are the twin beads and magatamas your talking about? I'm guessing the twins have 2 holes, but not sure. IV been away from beading for a few years now. Due to the economy we had to move into an RV and I just didn't have the room. I missed beading so much. Now we reasently have a small house but that's a castle to me. I have room to bead now. But I'm finding there a lot of new beautifull beads. I found your blog and love your work. I can't wait to get some of your patterns. I do know some seed bead stitches so I hope I can follow your patterns. What do you think? Interesting review of twin beads, I really love your runway bracelet and definitely think you should make a tutorial for the pink/gold one. Blog very inspiring, as always! WOW! They are all great bracelets!!!! Nancy, your bracelets are absolutely gorgeous! Thanks for the information about the beads! So pretty Nancy! I think it would be a great tut! can you reveal where the tutorial came from on the rope bracelet please. I love it and I love your color choices. Donna, it was a tutorial by DebGer on Etsy - but I can't recall the name of it off the top of my head, sorry!